Home vegetable gardening has always been popular in Los Angeles County. 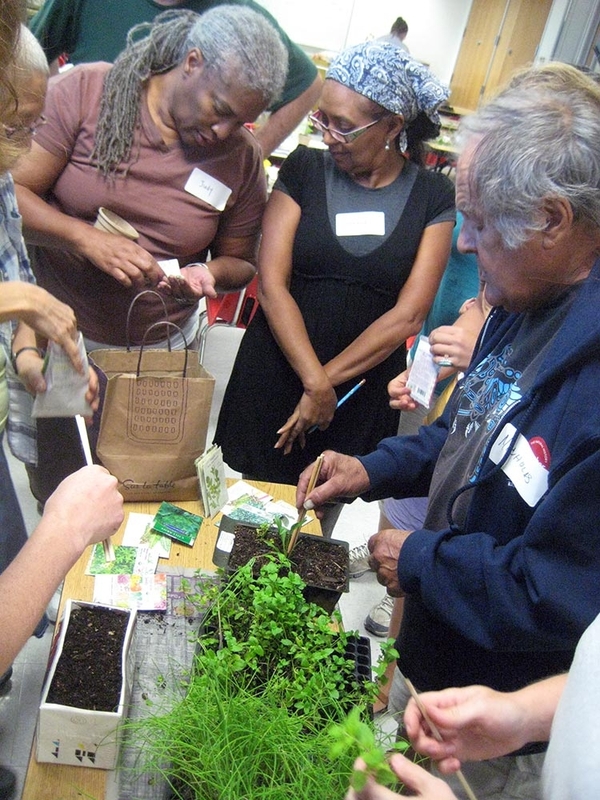 At the UC Cooperative Extension office in Los Angeles, we have a long history of teaching people how to garden through our Common Ground Garden Program. We began to get even more inquiries than usual from beginning gardeners starting three or four years ago. As it turned out, this was part of a larger trend. A national survey showed a 19 percent increase in edible gardening in U.S. households in just one year, between 2008 and 2009. We were excited about this new enthusiasm for home food production. However, based on experience at the community level, we were aware that new gardeners often floundered and might not continue gardening without support and a taste of success. Grow LA participants at the Natural History Museum. To address this growing audience of beginning vegetable gardeners, we developed a four-session workshop series, led by seasoned Master Gardener volunteers, to help new gardeners gain the fundamental skills needed to become successful. We call this the Grow LA Victory Garden Initiative. Training groups are kept small, 10 to 15 people, and are largely hands-on. New gardeners learn to prepare soil, plant seeds and transplant seedlings, water effectively and control pests. After training, the new gardeners continue to meet with their group leader informally, encouraging one another and sharing gardening tips. 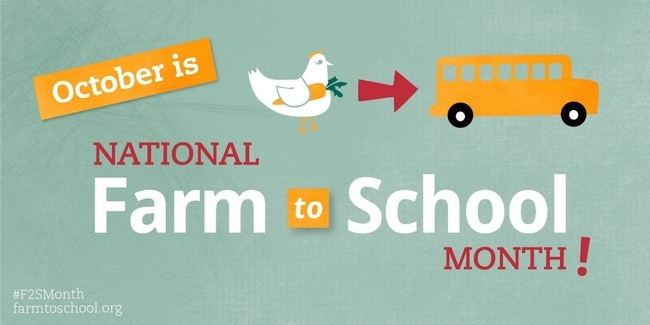 This initiative has been popular and successful. Since we kicked off “Grow LA” in spring, 2010, we have trained 1,130 beginning gardeners at more than 40 sites around the county, including community gardens, parks, churches, libraries, schools and museums. One outcome of this project has been the development of a manual for participants, the Vegetable Gardening Handbook for Beginners. Our staff, led by Yvonne Savio and Valerie Borel, compiled the basics of vegetable gardening into a 44-page manual. With support from the Metabolic Studio, a direct charitable activity of the Annenberg Foundation, we were able to print the manual for participants, and translate it into Spanish.  Thanks to the efforts of UC ANR News and Information Outreach in Spanish, the Spanish-language version has just become available. Both versions are available free on-line, and we hope others will find them helpful as well. Upon first taste, many Californians often argue whether cherimoya tastes like a combination of pear, banana, lemon or other familiar fruits. But Isabel Barkman, UC Master Gardener who grew up eating the subtropical fruit in her native Chile, says that’s not quite right. “I say it tastes like heaven. 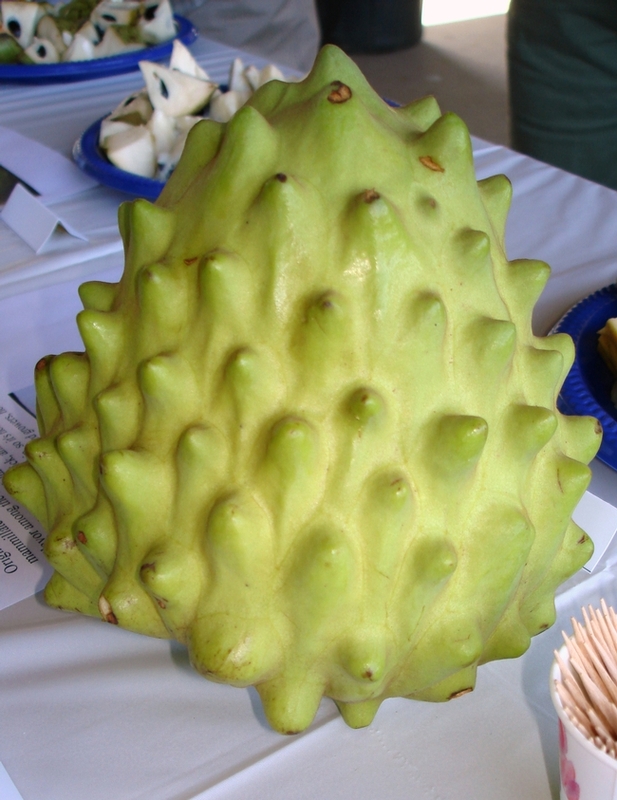 The cherimoya tastes like cherimoya. It’s creamy. It’s incredible. Nothing tastes like it,” she said. 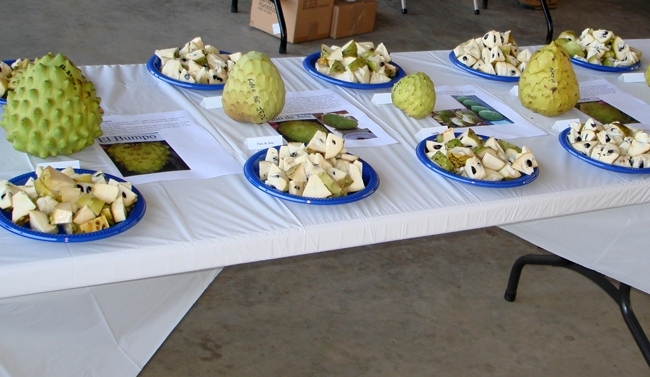 On Saturday, she helped organize a tasting of 15 varieties of cherimoya at the UC South Coast Research and Extension Center. About 120 local residents, UC Master Gardeners and members of California Rare Fruit Growers attended. 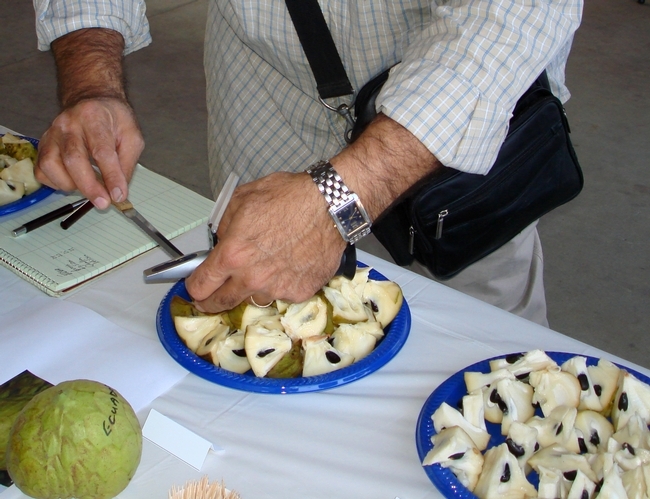 Though “heaven” wasn’t an option, participants were given a scale of 1 to 5 to rate the cherimoya varieties based on exterior attractiveness, texture, flavor and overall quality. 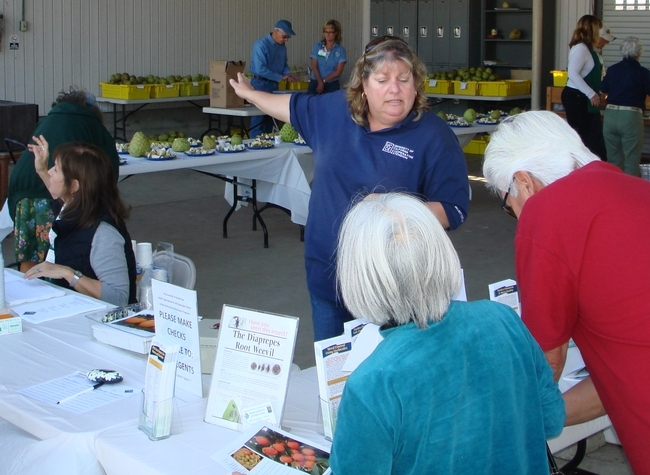 Tammy Majcherek, who works at UC South Coast Research and Extension Center and was in charge of the tasting event, explained that the evaluations will help gardeners and homeowners better know how different varieties grow locally, before they consider planting their own. The center has small orchards of both cherimoya and persimmon that aren’t being used for research projects, but staff members want to continue maintaining the trees and share them with the public, one way or another. “Because of budget cuts, we've been trying to figure out ways to keep these collections going or to re-propagate some of the best," Majcherek said. "One of the things that we’re in the midst of planning is an urban horticulture extension project with a demonstration orchard, where the public can come and see the various types of trees that they could grow in this area." Of the 100 or so cherimoya trees currently planted at the center, the best varieties would be included in the public demonstration orchard – and the results of the taste testing will eventually help staff members select which trees to plant. The 15 varieties at the tasting were Big Sister, Booth, Chaffey, Deliciosa, Ecuador, El Bumpo, Fino de Jete, Ludica, Nata, Orton, Oxhart, Pierce, Santa Rosa, Selma and Whaley. Though the data from the taste testing haven’t been tabulated yet, Barkman has her own favorites among the varieties. She said that El Bumpo also produces large fruits. The varieties Fino de Jete and Nata can have excellent flavor, and this year Pierce fruits likely had the highest brix, signifying high sugar levels. Behind the scenes, preparations for the event included harvesting the fruit more than a week ahead of time so that it would ripen. Fortunately the fruit were ripe for Saturday’s event, and extra fruit were available for participants to take home to ripen and share. Majcherek explained this was the first time the center has organized a tasting event for the cherimoya. She was surprised that so many of the participants already knew about the fruit. She plans to hold another tasting event for cherimoya next year, as well as a second tasting event for persimmons in the fall. 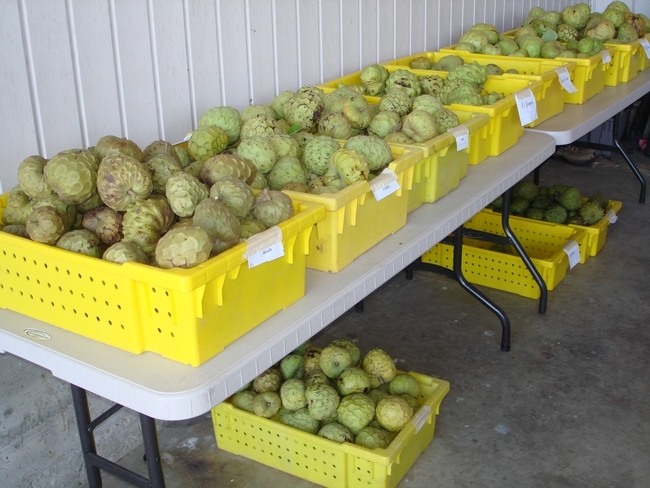 For more information, UC Cooperative Extension Ventura County has a page about growing cherimoya commercially and the UC Davis Postharvest Technology Center has recommendations for maintaining postharvest quality of cherimoyas too. Information about future tastings will be posted to the UC South Coast Research and Extension Center website. Beautiful gardens are brimming with color and life at the Veterans’ Home in Ventura. These gardens have been planned, planted and cared for by a group of Ventura County UCCE Master Gardeners and many people in the community. Flowers and ornamental trees provide color and shade. Raised garden beds are filled with a wide assortment of vegetables to enhance nutrition and dinner salads of residents. An orchard of donated fruit trees has taken root on the west side of the building. Garden lectures provide enrichment for the mind. An additional vegetable garden and succulent garden are planned. 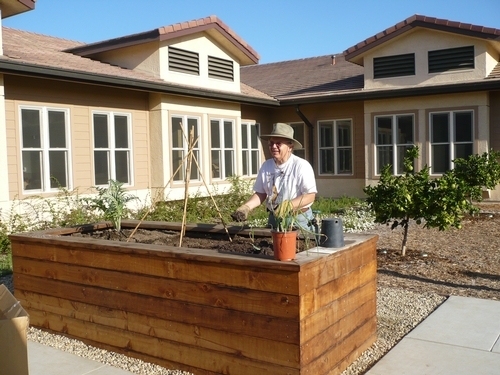 Started shortly after the home opened, the gardens and the activity they generate provide much joy and nutrition to the Veterans’ who reside at the home. 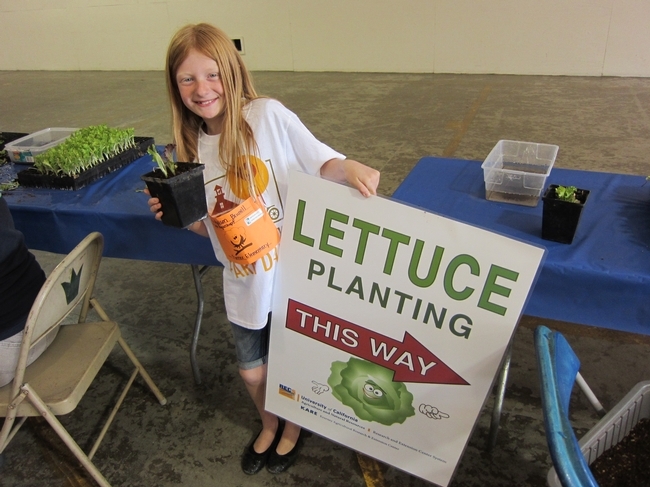 To learn more, or if interested in becoming involved, contact Master Gardener Barbara Hill. Raised garden beds allow elderly residents to garden without bending over. 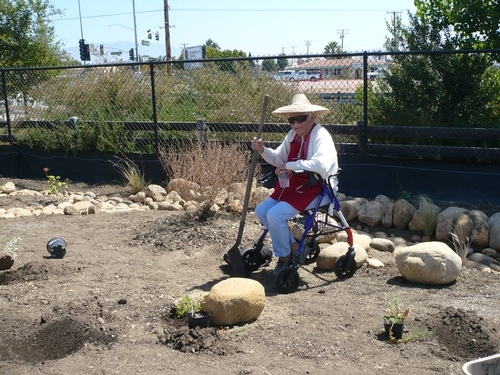 A resident enjoys a 'dry stream bed' in the Veteran's Home Garden.